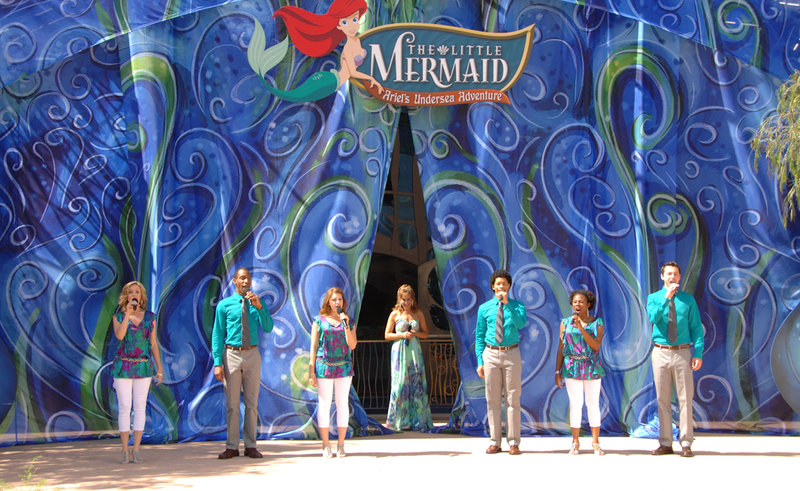 Jodi Benson, the voice of Ariel in the The Little Mermaid, performed at Disney California Adventure park Thursday afternoon during the dedication ceremony for The Little Mermaid – Ariel's Undersea Adventure, a new attraction based on the 1989 movie. Benson was joined onstage by Walt Disney Parks and Resorts chairman Tom Staggs; Academy Award-winning composer Alan Menken; and Sherie Rene Scott, who originated the role of Ursula in the Broadway production of The Little Mermaid. 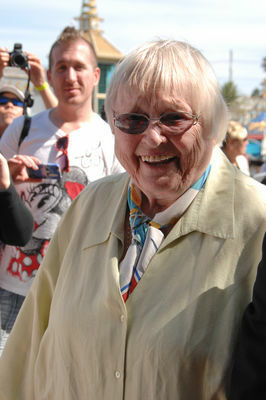 Pat Carroll, who voiced Ursula for the animated feature, also attended the ceremony. 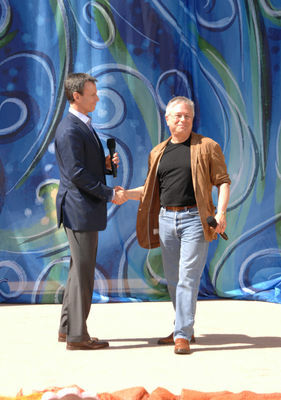 Walt Disney Parks and Resorts chairman Tom Staggs (left) introduces composer Alan Menken. Photo by Frank Anzalone. 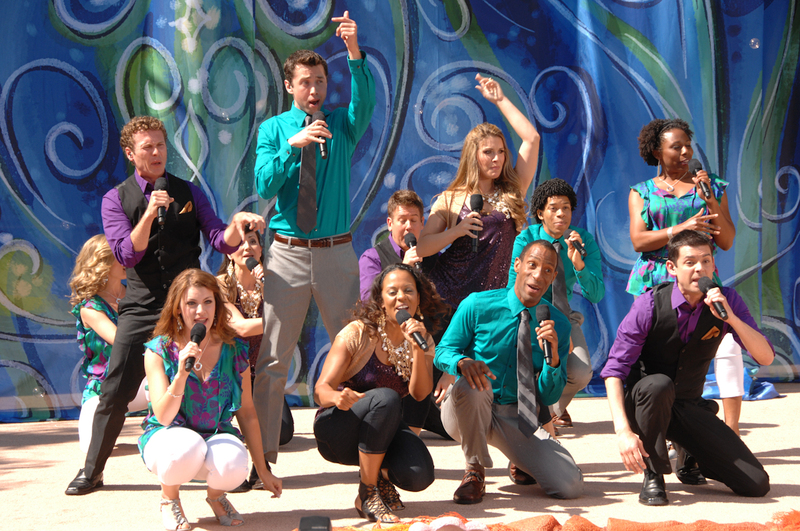 Jodi Benson (center in long dress), the voice of Ariel in The Little Mermaid, performs at the dedication ceremony for The Little Mermaid – Ariel's Undersea Adventure. Photo by Frank Anzalone. 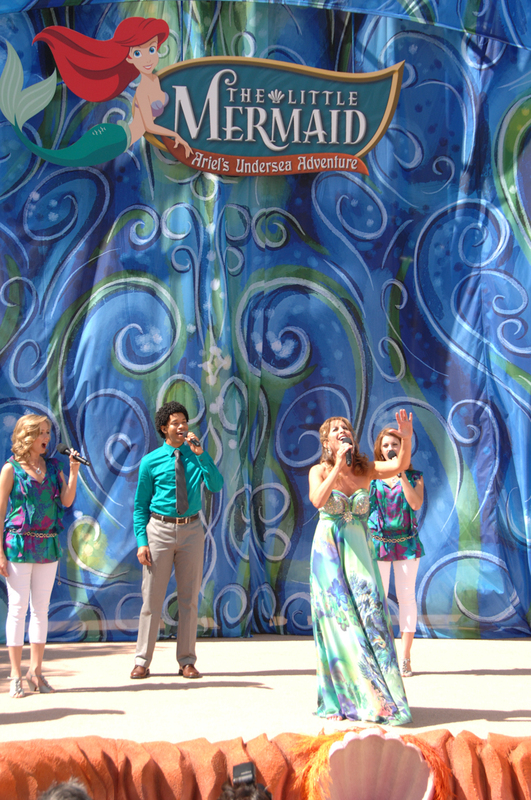 Jodi Benson performs "Part of Your World" at the dedication ceremony for The Little Mermaid – Ariel's Undersea Adventure. Video by Jeff Moxley and Steven Ng. Jodi Benson performs "Part of Your World" at the dedication ceremony for The Little Mermaid – Ariel's Undersea Adventure. Photo by Frank Anzalone. Sherie Rene Scott, who originated the role of Ursula in the Broadway production of "The Little Mermaid," performs "Poor Unfortunate Souls" at the dedication ceremony for The Little Mermaid – Ariel's Undersea Adventure. Photo by Frank Anzalone. 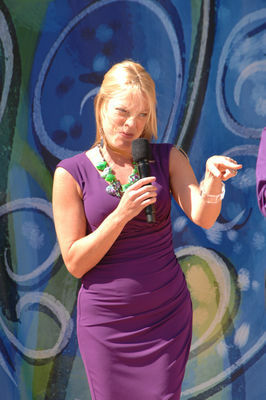 Sherie Rene Scott, who originated the role of Ursula in the Broadway production of "The Little Mermaid," performs "Poor Unfortunate Souls" at the dedication ceremony for The Little Mermaid – Ariel's Undersea Adventure. Video by Jeff Moxley and Steven Ng. 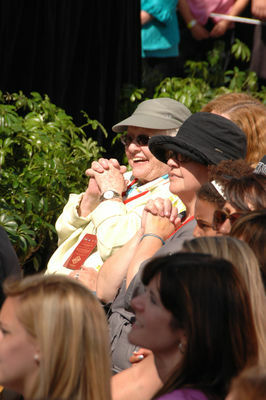 Pat Carroll, the voice of Ursula for the animated feature, watches as Sherie Rene Scott perform "Poor Unfortunate Souls" at the dedication ceremony for The Little Mermaid – Ariel's Undersea Adventure. Photo by Frank Anzalone. Disney singers perform "Kiss the Girl" and "Under the Sea" during the opening ceremony for The Little Mermaid – Ariel's Undersea Adventure. Photo by Frank Anzalone. Jodi Benson and Sherie Rene Scott share the stage at the opening ceremony for The Little Mermaid – Ariel's Undersea Adventure. Photo by Frank Anzalone. 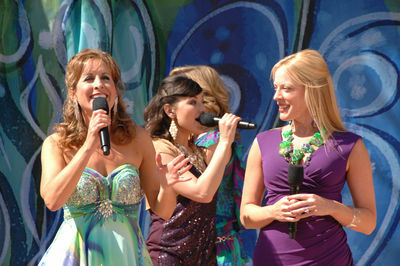 Jodi Benson and Sherie Rene Scott share the stage for a final medley during the opening ceremony for The Little Mermaid – Ariel's Undersea Adventure. Video by Jeff Moxley and Steven Ng. 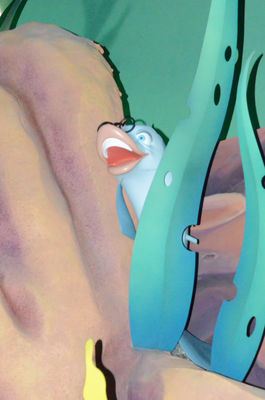 [Left to right] Jodi Benson, Tom Staggs and Sherie Rene Scott welcome the audience to The Little Mermaid – Ariel's Undersea Adventure. Photo by Frank Anzalone. [Left to right] Jodi Benson, Alan Menken, Pat Carroll and Sherie Rene Scott at the opening ceremony for The Little Mermaid – Ariel's Undersea Adventure. Photo by Frank Anzalone. Following the dedication ceremony, invited guests and media had the opportunity to experience the new attraction before it opens to the general public Friday morning. Pat Carroll greets fans on her way to ride The Little Mermaid – Ariel's Undersea Adventure. Photo by Frank Anzalone. 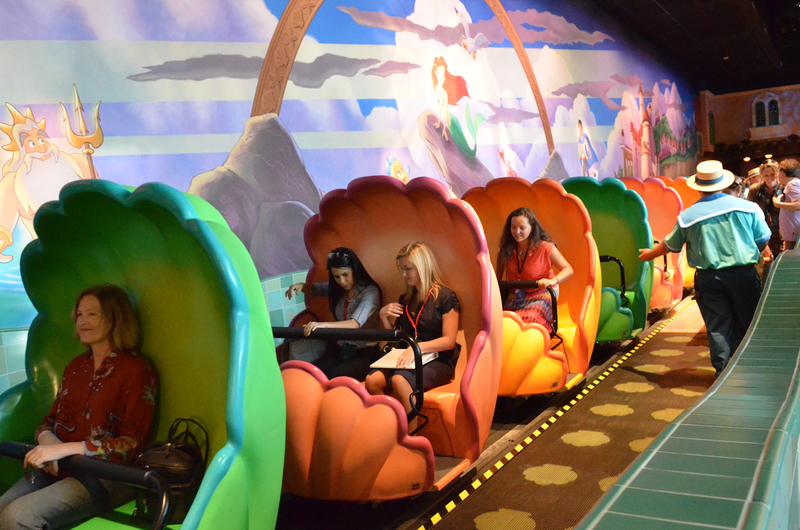 Climb into a clamshell for a voyage under the sea in The Little Mermaid – Ariel's Undersea Adventure. Photo by Frank Anzalone. 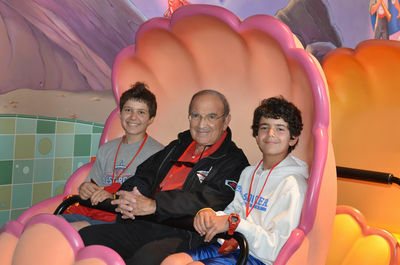 Retired Imagineer and Disney Legend Marty Sklar rides The Little Mermaid – Ariel's Undersea Adventure. Photo by Frank Anzalone. See if you can spot this cameo by The Incredible Mr. Limpet when you ride The Little Mermaid – Ariel's Undersea Adventure. 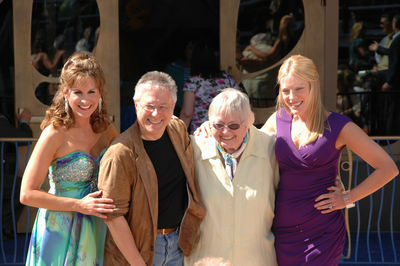 Photo by Frank Anzalone.